I have enjoyed motorcycle camping for many years, even though I have sometimes had troubles with tents. Twice I have had a tent fall down on me during a rain storm, which might make you think that buying a waterproof tent comes second to buying a windproof tent. But when you manage to finally get it together, camping is fun. I must start with a clarification. My definition of motorcycle camping is an activity done by a riding a 2 wheeled motorcycle to where I'm going while carrying all the stuff I need to sleep. I do not bother to bring cooking appliances with me. If I cannot make a meal with firewood and food from a nearby grocery store, I will ride or walk to a nearby restaurant. So I hope everything is clear now, and I can proceed with my explanation of what kind of tent to bring, assuming I already have figured out what kind of mattress and sleeping bag, and that I know how to pack everything. Most tents have poles, and the poles break down into segments. The length of the pole segments is what determines how long the tent will be when packed, and so will also determine the size of bag I need to pack my camping gear. By way of explanation, I have already decided the most efficient way to carry sleeping accommodations on a bike, is to pack the tent, sleeping bags and mattresses in a duffel bag and strap it to the luggage rack or the passenger seat (if either is available). Some people prefer to pack the poles separately, which gives them more freedom in jamming the tent in any old space. I prefer to roll up the poles in the middle of the tent, where they are well protected and will not be lost. As I read about tents, I come across this concept: A "Bomb Proof" tent. Be assured, that no tent will survive a direct hit from a bomb. But neither will a tent survive a tornado without some precautions. (Precaution number one, never camp in Kansas. People in Kansas, don't write comments complaining about this, do something about those tornadoes then get back to me). In the same vein, there is no perfect do-all tent. 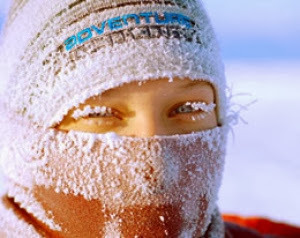 What you must do is decide where you want to camp, and in what weather (and other) conditions. Then get a tent that is the best balance of your conflicting requirements. And then, go to where the conditions match your tent. A tent design is always a trade off between different requirements. A tent designed for winter conditions does not need to be waterproof, for example. Neither does it need to have bug screens. But it should have a very strong roof support, and probably also be fireproof in case anyone lights a fire inside for warmth. Tents for "stealth" camping (i.e. free camping) should be subdued in colour, not gaudy oranges or yellows with glow in the dark ropes. When I go camping, I hate being bitten by mosquitoes, so I always get a tent that seals up completely except for screen windows to let in air. In fact I hate mosquitoes so much, that I also want my tent to be windproof, so I can set up out in the open, far from sheltering trees. Preferably on an open beach area. That's because I know mosquitoes don't like windy areas. I don't need a tent so big that I can sit in it all day. When I'm motorcycle camping, I spend most of my time outdoors. So the tent only needs to be big enough for me and my wife to sleep in, and to be able to change clothes in. I know can change clothes with about 110 cm of head room. I don't need a tent that I can stand up or sit in a chair. I also don't want something the size of a coffin where I can only lay down. The headroom is very important, and everyone needs to make their own decision. But the more headroom you have, the less wind resistant the tent is, and the heavier it needs to be. Weight may not be as important for a motorcyclist as it is for a backpacker, but my luggage rack can only take so much weight. Head room is an important consideration, but so is the floor plan. A person needs to be able to stretch out straight. Some people sleep on their sides with their arms stretched out. You need to allow for this. I have a "wide" mattress: 25" or about 60 cm. I need the tent to be wider than the mattress so that I can sleep properly, because I cannot not fit my arms comfortably on the mattress. I find that 160 cm is good enough for two people to sleep side by side without interfering with each other. Never mind those diagrams that "prove" two people can sleep with only 130 cm of space. I can't sleep like that. And I also like extra space to put my stuff. So normally, for me and my wife, we would need a 3 person tent. But one exception to that is the MEC Wanderer 2 tent, which I have, and it happens to be as big as other makers' three person tents. There are exceptions to every rule, I guess. In 2012, we took our tent out west and ended up in some extremely mosquito infested areas. I almost wished I had a bigger tent so we could spend all our time inside it. Once, it was so hot and buggy in the campsite, I simply went for a motorcycle ride, solving both problems at once. Next summer, we are heading to Newfoundland with the same tent. I am already searching for campsites next to the ocean and away from trees. Good thing our tent is not much bothered by wind, although it is fairly heavy. But we will also probably have lots of rain, and that is another area our tent is quite good. It has no fancy windows, but it has a simple streamlined shape, with aluminum poles and lots of guy wires. It should hold up to steady 50 kph winds with rain if necessary. In those conditions, we will not be bothered by too many bugs. And that's how I like it. There has been a controversy about Megyn Kelly saying Jesus is white, and a big part of that controversy centres on whether or not the comment was racist. The second part of this controversy, one that has not been clearly stated, is whether or not racism is still alive and well in America, or if racism is all in the past, as many people want to believe. If you can prove Megyn's statement is not racist, you could probably also say racism is over. But if you can prove the statement is racist, then you have proved racism is still rampant. Here is my proof. The fundamental belief that is necessary to support any racist system, is that people can be classified neatly into races. Let me give you an example. In Nazi Germany, in order to support their racist policies, not only it was necessary to believe that "Germans" and "Jews" were two different races, but it was necessary to believe that you could easily classify any person as either a Jew or not a Jew, and based on that certainty, you (as a for-sure-German) were now morally permitted to ban the for-sure-Jews from your society. And then to kill them when it suited you. To be non-racist, you would have to believe that being a Jew or Non-Jew did not matter. Another small but important part of that non-racist point of view is that you cannot always tell whether someone is a Jew or a non Jew. This argument about being able to tell which race is which is fundamental to racism, and cannot be ignored. A racist always tends to think that races are immutable, that mixing races is an abomination akin to homosexuality. If you believe that mixing races is not a problem, and recognize uncertainty, then you are probably not a racist. In fact, logically, I do not think it possible to be a racist if you do not think in absolute terms. Separating the races is absolutely fundamental to racism, without it, racism cannot work. Now for Megyn Kelly's remark that Jesus is white, because it's a historical fact. 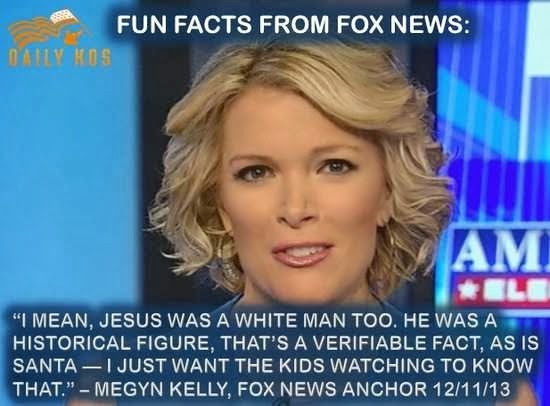 To me, just the very fact that Megyn apparently believes that it is a "fact" that Jesus is white, and makes me wonder if she is racist, whether the historical "fact" is true or not. And I'm pretty sure Megyn Kelly does not think of herself as a racist, but then that's true for most racists these days. But is it really true that Jesus is absolutely white? Well, no. For one thing, if he was a historical person, then when he was alive he was probably something in between white and black. But for true Christians, Jesus is much more than a historical figure, he is "Son of God", right? So if Jesus has a race then God obviously has a race, as I think we all agree that race is handed down from one generation to the next. So by saying Jesus is white you are saying God is white. Carrying this racist idea a little further, you are also saying that races exist in Heaven. (Heaven being where God and Jesus "live" right now.) And you are making an assumption that if any orientals, black people, or Arabs make it to Heaven, they are going to be stuck with their race for all eternity. And I'm sure Megyn thinks that when she goes to Heaven, she is still going to be a cute white girl, and her opinions will still count for something. Another thing that is believed by many (if not all) Christians, is that Jesus is coming back to Earth. Not as a spirit, but as a real man, like he did back in year nought. After all, Jesus himself said so, he just didn't give us the precise date. I'm sure you see by now where I'm going with this, but anyway... Jesus will have do decide what race He is going to come back as. Does he come back as the same race as last time, or does he pick some other race? Does he come back as a man or a woman? I'm sure the white supremacist Christians would have a conniption fit if he (or she) came back as a black ghetto kid. In fact, I'm pretty sure they would absolutely deny that this was Jesus, no matter how much water he turned into wine or people he raised from the dead, how much water he walked on, or how many people he could feed with a basket of loaves and fishes. In my opinion, if people in America do not believe that race exists in Heaven, then they can say they are not racists. 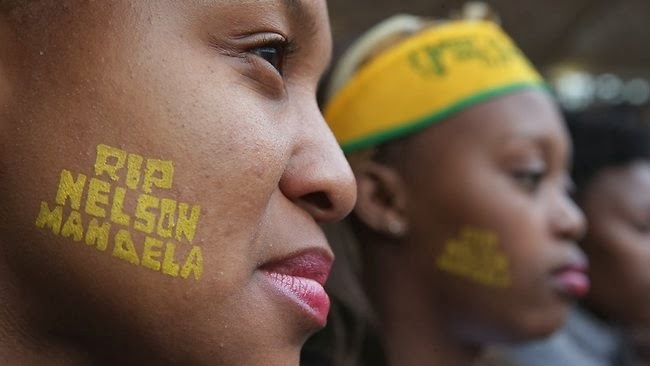 But if they believe that Jesus was white, and stays white in Heaven, and will be white when he returns to Earth, you can tell they are still racist. Picture: From Daily KOS website. At Christmas time, there are many ideas floating about on how to make the holiday more "Christian". For the last few years, Fox News has been saying the greeting "Happy Holidays" is offensive to real Christians. How do we really put the Christ back in Xmas? I have come up with a list that I would like to share. It is partly ideas I got from other people, some ideas are rooted in tradition, some ideas come from the 4th annual Fox News "war on Christmas" campaign. 1. We need to make some strong statements that Santa is of the white race. Apparently a lot of non-white people feel like they can make Santa any colour they wish, and this has to stop if we are to retain the true Christmas spirit. 2. We should not entertain thoughts of a "Christmas Penguin" similar to the Easter Bunny. In case you couldn't guess, this idea came to me from the Fox News campaign, although the original idea came from Aisha Harris, of Slate. Another reason we can't have a Christmas Penguin is that the Penguin is the symbol of Linux. 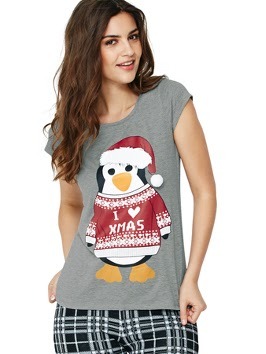 But when I Googled "Christmas Penguin" (with quotes) I got 457,000 hits. And Google Images has no shortage of examples. So apparently, this anti-Christmassy move is underway already. And while we are on the subject, how many times must I remind you people there are no penguins at the North Pole? So it makes no scientific sense at all. 3. A third idea inspired by Fox News, ban all Festivus Poles, especially those located in public places where they may interfere with Christian Baby Jesus Manger scenes. 4. Christmas time might be a very appropriate time to read the bible, especially the Christmas Story in Luke 2:1-20. If you know anything about shepherding, just ignore Luke 2:8, because you will know that shepherds in the holy land to not actually "watch their flocks by night" in December, which might make you think that the birth date has been changed to match a Pagan tradition of worshipping the winter solstice. 5. While reading the bible, you may also want to skip all the chapters advising people to stone each other for minor transgressions such as working on the Sabbath. By the way, "working" is interpreted to include air travel. And for sure the pilots, baggage handlers, and mechanics are working, so they must all certainly be killed in this particularly gruesome way. But hey, how else are we supposed to show our true Christianity if not by obeying the Bible blindly. 6. If you want to upstage the neighbours piety, may I suggest this instead of setting up even more inflatable front lawn displays. I suggest you sacrifice some of your livestock to God. If you are not a farmer, I think it would be acceptable to instead sacrifice the family dog. Please do not sacrifice any of your children before consulting with your pastor, no matter what you may have read in the Bible. Now seriously, I hope everyone who reads this can tell it is humour. I do not really recommend any of these measures, I am just trying to point out, with examples, what is wrong with some people's narrow view of Christmas, as promoted by Fox News, which I am thankful we don't get in Canada. I prefer a liberal kind of Christianity that is based on freedom of religion, on tolerance, on helping the less fortunate, on making everyone feel welcome regardless of race or creed. I suppose this might offend some stricter Christians who think they are doing good by saying prayers in school, wishing people "Merry Christmas" and not "Happy Holidays", singing carols and putting money in Santa's pot. But come on, everyone should know that the real spirit of Christmas is feeling love and not hate. Happy Holidays to all. (and I mean that in a good way). Green Party of Canada: Good or Bad Science? "Elizabeth May’s Party of Science seems to support a lot of unscientific public policies". I don't always vote for the Green Party, but that is mainly because we don't have runoff voting. Your first vote better count when you vote in Canada. I support science, and any party that also genuinely supports science. So if it's true that the Green Party is supporting a lot of unscientific public policies, I will not vote for them. Knowing already that the National Post runs a lot of prejudiced material supporting the Conservative Party, and knowing that many NP titles do not match the article they were pasted to, I decided to read it and see for myself whether the Green Party was science based or B.S. based. I would have to say first, that for once the title matched the content of the article. And that seems to support my rule that if the title matches the URL link name, then it didn't get a make-over by the Propaganda-wise Title Editor. So now on to the content and see if the conclusions are fair. “I really think the Green Party is just doing the same things everybody else does, which is to make up an idea that matches with your ideology, and then go looking for evidence to support it,” said Michael Kruse, chair of Bad Science Watch, a non-profit devoted to rooting out false science in public policy. I had to investigate who Michael Kruse is. Although he does not seem to be a scientist, he has set up a non-profit group called "Bad Science Watch". I didn't see anything on the web site about global warming, but I did see something about Wifi radiation. "Investigating ant-wifi activism in Canada." Then I did a cross check and found that the Green Party (or Elizabeth May) has said that we rolled out wifi too quickly in schools without proving that it is harmless. So if understand correctly, that makes Elizabeth May an anti- wifi activist, and so Michael Kruse is not a really impartial scientist making his anti-Green party claim. Furthermore, if Bad Science Watch is committed to rooting out *all* bad science in public policy, maybe they should be investigating how the Conservative government is ignoring global warming. At this point, I have not really settled yet whether Michael Kruse is an impartial commentator. And so far I have only gone through about 10% of this National Post article. I'm not sure I have the time to slog out all the remaining details, so after the first dodgy reference, I will just start to skim for glaring errors. If it is Green Party policy to oppose new scientific technology, such as Wifi, nuclear power, genetically modified foods, coal powerplants, and tar sands development, that does not necessarily make them unscientific. They would only be unscientific if they opposed these technologies regardless of scientific evidence. But the Green party clearly states that they believe that much of the true unbiased scientific research has been undermined by corporate interests, with big think tanks funding pseudo scientific research to support their profitable activities. GreenParty.ca, for instance, is host to a two-part blog post earnestly trumpeting the evidence for “abiotic oil,” a theory from Stalinist Russia that petroleum is not derived from biological matter, but is rather a geological substance dating to the origins of the earth. I happen to think it is particularly nasty (though not unusual for the NP) that the article finds this way to link the Green Party to Stalin. But Abiotic Oil is not a policy of the Green Party at all. The blog they refer to is here, is written by David Bergey. This blog is, as they said, hosted by the Green Party website. But of the three comments following this blog post, all are dismissive of abiotic oil, mainly because it is unscientific. And abiotic oil theory has not been the basis of any policies of the Green Party. Picture: I found the picture of the kitties on the internet. 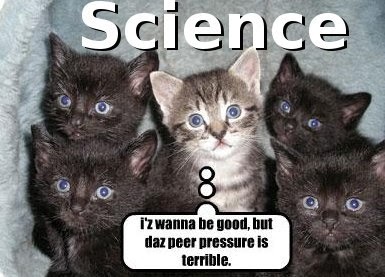 I added the word "Science" to illustrate the dilemma facing scientist who are offered funding by large corporations. Are Cost of Living Subsidies for Northern Canada Too Expensive? Do Canadian First Nations people in the north of Canada really have too high a cost of living? Do we need to keep subsidizing them? I want to help answer this question. Here is a comment to start us off. You have to wonder whether it would help, just a bit, if they moved to a part of Canada where it didn't cost ridiculous amounts of money to ship things to them. In answer not only to Mike Zwarich, but to everyone I know who is at a loss about why Indians and Eskimos (or First Nations people) continue to live in that part of Canada where milk is expensive, it is not because Canadians are a stupid people. The answer is partly in the subject of sovereignty. I may have to explain "sovereignty" later, in the meantime you could Google it if you didn't learn it in high school history. Now, here is a quote from a government of Canada website about our sovereignty. With 40% of our landmass in the territories, 162,000 kilometres of Arctic coastline and 25% of the global Arctic – Canada is undeniably an Arctic nation. The Government is firmly exercising our sovereignty over our Arctic lands and waters – sovereignty that is long-standing, well-established and based on historic title, international law and the presence of Inuit and other Aboriginal peoples for thousands of years. At the same time, international interest in the Arctic region is growing, in part as a result of possibilities for resource development, climate change and new or longer access to transportation routes. Canada is demonstrating effective stewardship and leadership internationally, to promote a stable, rules-based Arctic region where the rights of sovereign states are respected in accordance with international law and diplomacy. I think there are two problems some Canadians have in understanding the north of Canada. First is, most Canadians do not live there, have never even visited there, never would want to visit there even if it was an all expenses paid trip. Most Canadians are huddled close to the US border, and spend more time wishing they could get into the US than wondering about what goes on in 90% of Canada's land territory. Second, never take "sovereignty" for granted, no matter how uninhabitable the land is, somebody always wants it. See how Canada is already fighting Denmark over possession of some island nobody even knew existed? We have fought most wars over sovereignty, believe it or not. Yes, Canada is the second largest country in the world. Most Canadians are aware of that fact, although they do not really understand it. We often call the 49th parallel the border between Canada and the USA, and yet most Canadian cities are on the American (or southern) side of that imaginary line called the 49th parallel. Feel free to look that one up on a map. I will concede Winnipeg, Regina, Saskatoon, Calgary, Edmonton and Vancouver are north. Victoria BC is south of the line, so is Toronto, Montreal, Fredericton NB, Halifax NS, St. John's NL, and Punkeydoodles Crns., ON. And (I'm guessing) 80% of the population of the country, along with 3 entire provinces. Canadians think they understand that Canada is really big, yet they do not understand how much of it they have not seen, how much is almost a wilderness. That is a problem, when you remember that most Canadians do not really understand why Canada, with a population of only 35 million (now, it used to be less) has sovereignty over this huge land mass, larger than the entire United States of America. One way to exercise sovereignty is to buy military equipment and train a large army, navy and air force. Canada with only 35 million people, does not actually have the economic ability to do that, and still maintain a high standard of living for it's masses huddled along the border. Russia can hold its territory with a population of 144 million and 17 million square km. (8.4 people/sq km) Canada's 35 million people claim 10 million sq. km. (3.5 people/sq km). For the Russians, claiming all that territory involved shipping millions of prisoners in chains to Siberia, raising a huge army and keeping everyone's standard of living quite low. Canada has had a relatively easy time of it, for various reasons that I don't really know right now, but I'm sure it'll come to me. But part of our equation would have to be our hospitals, schools, airports, harbours, the extensive maps, and the Canadians who live in the far north, and most of them are still First Nations people. In the end, it is much cheaper and more effective to claim land by treating the First Nations people as part of Canada than to bring them south to live in squalor in Saskatoon and spending a hundred times as much money on new jet fighters. A ten dollar litre of milk doesn't seem so expensive now, does it? "After sneaking past security to get into Mandela event, Mulcair bops along with Kim Campbell’s dance moves"
Someone at the National Post is fond of writing sensational right wing headlines that have a significant disconnect with reality and not even connected with the words of the attached article. This title needs a walk-through, as it is more highly salted with mockery and propaganda than most. And I find it particularly in bad taste that the National Post's title mangling editor is using Nelson Mandela's memorial like this. After reading this article, (and I can only hope that the National Post readers actually read the articles) it is quite obvious that Mulcair did not sneak past security. It was a mixup at the security outside the stadium, probably very run-of-the-mill happening. Next, the dance moves. I actually have more to say about that, as I lived in West Africa for three years during which time it gradually became obvious that Africans dance to everything. Actually, I could go even further and make a strong case for all our modern popular dance in North America (at least since the end of the big band era) having African roots, including the Twist. Back in the fifties, when it first started becoming popular among White Americans, there was a massive backlash against it, claiming that this type of dance was only appropriate for Negros. And even today there is a slight residual negative feeling about dancing (or "bopping" as the Post calls it) among our more stuffy white right wing citizens. I myself am not a great dancer, OK not even a good dance, OK pretty bad dancer. I would probably lose a dance contest to Sheldon Cooper of the Big Bang Theory. But never mind that, I did dance while I was in Africa. You have to be very stuffy indeed to not feel the infectious rhythms, and nobody makes you feel foolish for dancing. I say that despite the fact that my high school age students used to invent dances based on their white teacher's dance moves. There was no offence intended, and none taken. It was actually all in good fun. Just to give one more example, although this one is not in Africa, the funeral marches of New Orleans. Watch this one. Dancing in Africa does not have the scandalous, and sexual overtones that it has in Canada, especially among older white conservatives. It goes on at any time, and funeral celebrations are no exception. I applaud Kim Campbell, a past Prime Minister of Canada (Progressive Conservative party, long story) and Thomas Mulcair for being open to the spirit. The exaggerated headline in Yahoo news read "Optical Illusion Will Make You Question Your Eyesight". The truth is, you actually should question your eyesight, and there are hundreds of optical illusions available to help you do that. But this is not one of them. Why? It is based on the Cornsweet illusion, and unfortunately, by attempting to jazz it up a notch, the presenters have kind of lost the original illusion's point. The question is, which object is lighter, the top of the bottom. The bottom one looks lighter, but the presenter says actually they are both the same, and you can prove it by blocking the center part of the image out. OK no, that's not an illusion. Because in this version of the illusion, it is quite obvious that there is a light source, and that given the light source and shading in the picture, the bottom object is actually lighter. 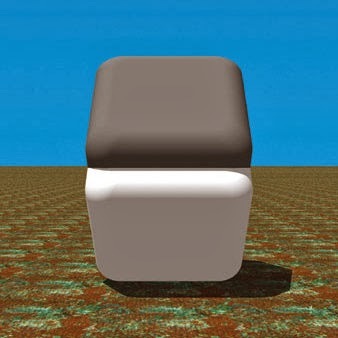 If you were to check the original Cornsweet illusion, you would notice there are no shadows, it is not an attempt to paint a 3 dimensional object. It is a pure scientific illusion, showing how our perceptions are influenced by a boundary with brightness contrasts. You are not really being fooled by this picture. Your eyes are simply telling you that if you saw that scene in real life, the bottom shape would necessarily be lighter. In fact there is no "normal" way to set up that scene in real life without having the bottom shape lighter. And by normal I mean without using specially focused multiple spotlights or other trickery to lighten or darken the shapes. But, I accept that in the picture, the paint colour of the two flat areas would be the same, and you would probably not notice that without blocking out part of the image. However, that is not a real optical illusion if you are stating the "top object is the same colour as the bottom object", as it is quite clear that the rounded edges are part of the objects, and they are not the same. What I wonder about is how easily someone in the hustle of ad-driven media can screw up a perfectly fine optical illusion and pass it off as real. And I also see once again, how Wikipedia, dull as it may be, almost always gets it right.